One of the speakers at our firm’s recent oil and gas seminar for land and mineral owners was Chris Atherton, President of EnergyNet, Inc. EnergyNet is an online auction site for oil and gas assets- mineral and leasehold interests. It now controls 75% of the online auction business for oil and gas assets in the U.S.; so far in 2016, it has sold 354 asset packages for $155 million. It makes its money by taking a commission on each sale. Properties are sold both in online auctions and in sealed-bid sales. Recently, the Texas General Land Office began using EnergyNet for its auctions of oil and gas leases on state lands. It also auctions leases for Colorado, North Dakota, Utah and Wyoming, and it has recently signed up the Bureau of Land Management to conduct lease sales. An example of an EnergyNet offer for lease of a state tract in Loving County, Texas can be viewed here. One of EnergyNet’s first big deals was sale of a package of 220,000 net mineral acres owned by Chevron in 2003, in dozens of counties in multiple estates. Chevron wanted at least $80 million. By breaking the assets down into smaller parcels, EnergyNet sold them for $120 million. LNG Produced in George West? Stabilis Energy has a facility in George West, about an hour south of San Antonio in the Eagle Ford field, that can produce up to 120,000 gallons of liquified natural gas a day. It opened in March 2015. The US Department of Energy has now given Flint Hills Resources permission to use shipping containers to export Stabilis’s LNG by trucking it to the Texas coast where it can be loaded onto LNG tankers and shipped to other countries. Other LNG facilities are located along the Texas Gulf Coast. Cheniere Energy recently opened an export terminal for LNG at Sabine Pass in Port Arthur and is building a second facility in the Port of Corpus Christi. Freeport LNG is building an export terminal southwest of Houston, and three other companies are seeing federal permission to build LNG export facilities in the Port of Brownsville. Haynes and Boone has published a list of the companies who have filed bankruptcy in the current downturn. View it here. 31 of the 63 companies listed are based in Texas. Yesterday Swift Energy, which filed for bankruptcy protection on the last day of 2015, announced that it has emerged from bankruptcy after completing a financial reorganization and selling some assets – the first company on the list to successfully reorganize. The largest E&P companies on the list: Quicksilver Resources, Sabine Oil & Gas, Samson Resources, Energy XXI Ltd., and Energy & Exploration Partners. Aubrey McClendon, the founder of Chesapeake Energy, died in a car crash last Wednesday, a day after he was indicted on federal charges of conspiring to rig the price of oil and gas leases. Numerous articles have reviewed his life and legacy. Russell Gold, senior energy writer for the Wall Street Journal and an energy journalism fellow at UT Austin, wrote in the Wall Street Journal that “Aubrey McClendon will be remembered … for helping to usher in an era of abundant natural gas, a weakened OPEC and a grievously wounded American coal industry. We are all living in the energy world that he envisioned a decade ago. ” McClendon was 56 years old. In some respects, McClendon follows the tradition of wildcatters like Roy Cullen, H.L. Hunt, and Clint Murchison – taking big risks, re-inventing the industry. In other respects, he was the 21st century energy entrepreneur. He was single-handedly responsible for reviving the natural gas industry in the U.S. and, as reported by Gold, “grievously wounding” the U.S. coal industry. He did not invent hydraulic fracturing, but he used it to reinvigorate the oil and gas industry in the U.S.
McClendon was forced out of Chesapeake in 2012, after growing the company into the second largest natural gas producer in the U.S. He started his new company, American Energy Partners, and was recently working on a deal to exploit a shale play in Argentina. The Texas Land & Mineral Owners Association Newsletter recently published an article disclosing that the Zavala County Appraisal District has denied agricultural-use special appraisal value for land used for oil-pad sites and frac ponds. One owner who challenged the re-appraisal got the District to agree that, if a well pad is not fenced, it won’t deny the ag-use appraisal for pad sites. But fenced frac ponds, it said, don’t qualify. When there is a “change of use” of land classified as ag-use or open-space use, the law provides that the change of use results in a “roll-back” of property taxes for five years. The owner is assessed tax based on market value for the five years, plus interest at 7% per annum. This can be a big hit for property owners. For one property owner in Zavala county, the assessed property value went from $73/acre to $2,000/acre. And, once a special use value is denied, it may take years after the oil company ceases its use of the property before the owner can re-gain the special use value. Oil prices are much in the news, especially in Texas. As oil prices continue to decline, the effect on Texas’ economy is settling in. And with all the talk of oil prices, OPEC is again the focus of much news coverage. What will OPEC do? How much does OPEC really control oil prices? What effect are the low prices having in the OPEC countries themselves? OPEC’s own website. It publishes a monthly report, available online, in English. The Texas Railroad Commission website stills says that “Texas has a long history of safe injection, and staff has not identified a significant correlation between faulting and injection practices.” After Azle’s visit to the RRC, it hired its own seismologist, David Pearson. In response to the SMU report, Pearson said that “We will not be suspending activity at the two wells, especially given the fact that we have not seen any continuation of large-scale earthquakes in the Azle area that would give us any cause for alarm. The swarm has died out and has been quiet for some time.” Milton Rister, the Railroad Commission’s executive director, wrote a letter requesting a meeting with the SMU researchers. Will Cities Lose their Power to Regulate Urban Drilling? Last month I wrote about the Texas legislature’s efforts to limit cities’ authority to regulate drilling within their jurisdictions, after the City of Denton passed a ban on hydraulic fracturing. The bill that has emerged is House Bill 40, sponsored by Drew Darby, chairman of the House Energy Resources Committee. It passed out of committee, but yesterday was returned to committee on a technicality. A companion bill in the Senate, Senate Bill 1165, has also passed out of its Natural Resources committee. The bill leaves may questions unanswered. For example, Fort Worth has an ordinance that regulates saltwater pipelines. Are pipelines an “aboveground activity” that cities can regulate? 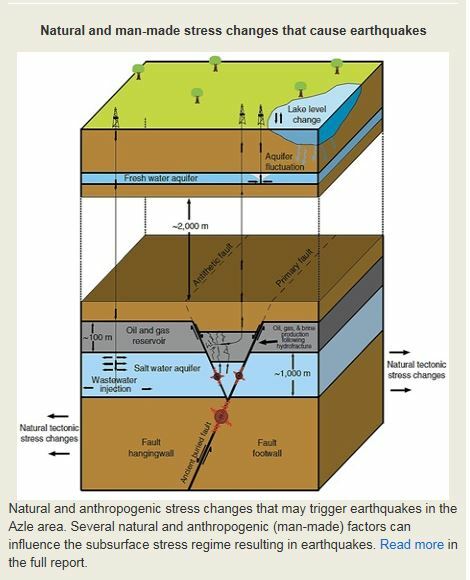 A recent “swarm” of small quakes in Irving has caused a stir and ignited a series of articles about the relation between oil and gas activity and seismic events. The quakes in Irving were strong enough to knock some books off of shelves. After residents of the town of Azle experienced a series of quakes in 2013, residents protested in Austin before the Texas Railroad Commission, and as a result the RRC hired its own seismologist to study the problem. Most scientists have linked quakes in Texas and Oklahoma to injection of large volumes of produced water. 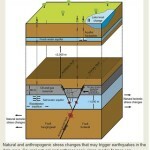 Recently one study in Ohio linked quakes there to recent fracking of wells in the area. Most if not all of the actual studies of recent quake activity are being done by Southern Methodist University. It has studied the quakes around Azle, and a report of its study is expected soon. After the quakes in Irving, SMU is installing seismic monitors in that area.